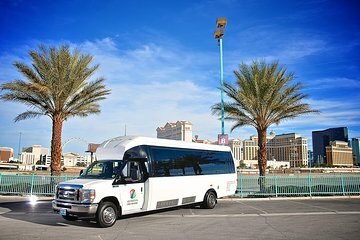 Make the most of your trip to Sin City with this private Las Vegas airport transfer aboard a 24-passenger van. Save your large group the hassle of arrival coordination by booking ahead. Your friendly and professional driver will meet you at touch down and ensure your trip from the airport to your hotel is as quick and comfortable as possible. A maximum of 24 people per booking. Transport was on-time, accommodating, friendly and very patient with our large group. Our Driver Scott was very knowledgeable about Las Vegas and surrounding areas and gave us lot's of tips for our stay. Honestly worth the cost. Our driver was excellent. Very very happy with our trip. Thanks again to him.